Each sale of this book for $15 will result in a $30 donation to African Famine Relief. Turn your $15 purchase into $30 of African famine felief. It only seemed natural to pair the launch of this new book by David Zinger and John Junson with famine relief for Africa. Our book was subtitled, taking a bite out of work, and we need to “take a bite out of famine.” The Canadian government will match donations up until September 16. 100% of all copies sold will be donated to famine relief which means that your $15 purchase of the book will result in a donation of $30 to famine relief. Take a bite out of work with 54 poems and 54 cartoons. 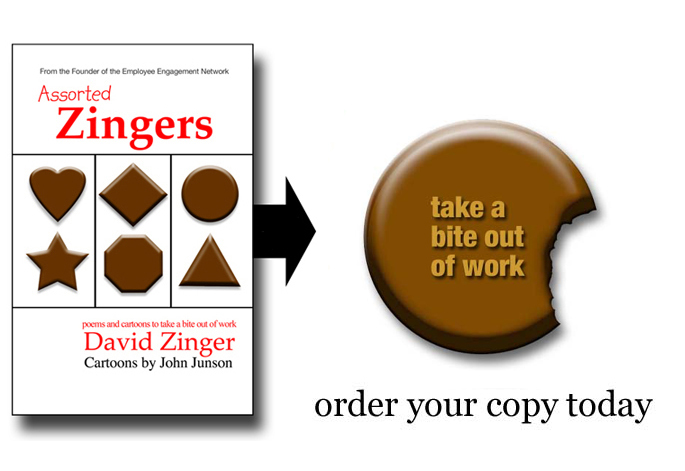 If you like reading David Zinger’s work on engagement, you’ll love his newest book. In addition, the book is co-authored with John Junson as they creatively weave together 54 poems and 54 cartoons into one volume. For the next 5 Tuesdays we will profile one poem and one cartoon. If you want to be one of the first to get the book we are offering it at 25% off the price. Through colorful caricatures and the spare lines of poetic conciseness, we are drawn in to ponder what is real and what is ridiculous, what is hilarious and what is holy, what is simply absurd and what should be absurdly simple. Within these pages you will experience a breath of fresh air, ample belly laughs, several wake-up calls, and even a few slaps upside the head. Poetry and humor are reputed as menaces to conformity, and they do not break with tradition here. All in all, they are invitations to shake off our cynicism, to embrace our humanity, and to inspire a bias towards action rather than apathy.